UPDATE: A mirror has been uploaded as the original video has been removed. Just in case you still have room in your brain for even more Smash content, Spanish YouTuber smashbrosspain has uploaded a video containing every alternate costume available for each fighter in Super Smash Bros. Ultimate. Now that’s dedication. What do you think of the new alternate costumes for fighters? Let us know in the comments! I wish they could go more detailed with some of the alternate costumes. For example, Samus’ Fusion, Dark and Light Suits should actually be structured like they were in their games, instead of just being re-colored Varia Suits. That's the only one I was really hoping for tbh. @Panda943 For as much detail as these directs went into for each character, they sure glanced over Random. Absolutely love the Team Aqua and Team Skull bandanas for Pichu. Although I can't figure out Pichu's 6th alt, nothing much changed other than its left ear having more fluff. The reference must've went over my head, is it the Pikachu and Pichu TV Special? I'm sure there will be a Nekky Nokky Nakey Mario without clothes, just with his Red boxer. Dark Samus’ alts look amazing. Incineroar has his Shiny form as a color swap! A lot of these just look fantastic. Peach doesn't have any of her delightful costumes she wore in Odyssey. Missed opportunity if i say so myself. Anyway did we know yoshi had his bright green yarn design? @pitstain9 I think that's the Spiky Eared Pichu from HGSS. Couldn't quite tell because it flipped through too fast but I think I saw the spikes on its left ear. @Tsurii Maybe Hilda's being planned as a DLC echo? @Bolt_Strike they said no Echoes in the DLC but that doesn’t mean they couldn’t find a way to make her unique. Though I do think Skull Kid is more likely for DLC. @Bolt_Strike Oh yeah, I completely forgot about that iteration of Pichu. Somehow I got mixed up with the one from the TV Special, but this is a great inclusion nonetheless. @gaga64 well, they could give her a wholly unique moveset just by giving her some of the ALBW exclusive items like the sand rod. Actually, the sand rod sounds like it'd be a fun move for Smash. Something like a side special that smacks enemies in the air? Do we have something like that already? Not enough costumes, too many alt colors. Wario's overalls render looks great. Weird that the buttons were gold but now they're white again? Who cares. He's got his Shoulder Bash (or as I call it, GO!) back and his Ground Pound as a throw so i'm not complaining. Plus we actually have Wario platformer characters as Spirits which got me really excited. We may have lost the black Yoshi color, but we got an adorable yarn Yoshi skin instead. I'll take the trade-off lol. Love the Shulk ones. Better than Wii U IMO. I'm sad that we had to lose costumes to get new ones. It can't be THAT hard to make a few extra for each character can it? Like, bringing the selection for every fighter up to 10? A lot of missed opportunities, like Hilda for example. Also I have to agree with SilverBrick, is it really that difficult to make a render for the Fusion suit? I guess this is the case for a lot of costumes, but when Ridley gets the special treatment with Mecha Ridley I just don't get the reasoning behind it. Last complaint for today... there also isn't a clear line between alts (for example Alph), echo fighters and characters that get their own slot like Lucas, Dark Pit and Falco. There really lacks some logic here. @Radbot42 It's from the NES golf game. @Radbot42: That's Mario's outfit from Nes Open Tournament Golf. I actually wish they would have included Luigi, Peach, and Daisy's outfits from the same games, especially Luigi's. @BMO_Advanced: There are 2 Nes Golf games: launch-title Golf, and Nes Open Tournament Golf. Where is Waluigi? Where is Waluigi? Where is Waluigi? Where is Waluigi? Where is Waluigi? Where is Waluigi? Where is Waluigi? Where is Waluigi? Where is Waluigi? Where is Waluigi? Where is Waluigi? Where is Waluigi? Where is Waluigi? Where is Waluigi? Where is Waluigi? Where is Waluigi? Where is Waluigi? Where is Waluigi? Where is Waluigi? Where is Waluigi? Where is Waluigi? Where is Waluigi? Where is Waluigi? Where is Waluigi? Where is Waluigi? Where is Waluigi? Where is Waluigi? Where is Waluigi? Where is Waluigi? Where is Waluigi? Where is Waluigi? Where is Waluigi? Where is Waluigi? Where is Waluigi? Where is Waluigi? I dig the Robo-Ridley costume, though I seriously wish Ike retained his Micaiah palette and that Dark Samus had an SA-X costume. I'm really upset that there is no Detective Pikachu costume. Would be cool if they had free updates for costume, heck I would pay a buck or two for costumes. Kinda wish Peach had her wedding dress, but just nitpicking. Would of loved to play Zelda, Link, Ganon as their different reincarnation. Inciniroar has a Shiny alt, finally a shiny alt. costume, i mean seriouslly, why did the pokemon who have official alternate colors, never had those official alternate colours in smash bros? I already preordered, but man...too much information about the game. I feel like I played 20+ hours already. I'm glad to see a Simon's Quest-inspired Simon Belmont color scheme. I have my main. Anyone else notice Ice Climbers faces swapping? Must mean Nana and Popo can interchange as the main controlled character. @nessisonett pretty sure that's been a thing since Melee or at least Brawl for sure. @BMO_Advanced: No, it wasn't in Golf. You are right. @Bolt_Strike I always hated that I couldn't send my spiky ear pichu into later generation games. Same thing with not being able to send shadow lugia over to the other games. @DragotheKomodo charizard has the purple alt which is basicly its original shiny color from us and it's yellow alt is based on its pre-evolutions shiny color. Greninjas black alt is its shiny colors. Bug catcher hat jigglypuff is shiny. Although mewtwo dosent have its shiny variant it dose however have an orange and blue variation both of which being its possible colors from Pokemon stadium. Pikachus red hat and choice band hats are both shiny. The Pokemon trainer female orange alt and male gold alt both have shiny squritles. Also in brawl the green alt had both ivysaur and squirtle as their shiny colors. @DragotheKomodo well, smash greninja's yellow parts might been a bit of a mix up as it was developed at the same time as the main series geninja. Also its main colors in game and in official art work (both its smash and official artwork pretty much the same)is also somewhat different with the in game version with the legs being darker in game and the face chest and webbing being more cream-colored in game. Guess they didn't want the shiny version being to black in smash. Now that I think about it, don't all of the dark/black alt costumes have some splash of a lighter color to them preventing them from being fully black? Link needs to stop wearing short-sleeved shirts. 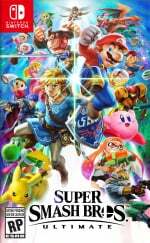 Is it bad that I am not hyped in the least for smash bros? Nintendo insults the fans by leaving out Waluigi. Chrom doesn't have his Mirage form as an alt?! Sigh To quote a certain someone: "WWHHHYYYY???" Sonic alts are awful, once again. @DragotheKomodo They did? We had Shiny Greninja in Smash Bros 4. So are we all just gonna ignore Incineroar's big the cat costume?